It’s become a familiar sensation, stepping out in the morning onto normally bustling city streets, and finding them desolate. Walking silently past shuttered cafés and storefronts, and slowly realizing that either (a) today is yet another public holiday, or (b) an annihilating pestilence has wiped out the city’s entire populace. Figuring that it must be (a), but secretly excited about the possibility of (b). Getting back home after having mentally stricken the day’s plans. Researching on the internet which random Catholic event we’re supposed to be honoring this time. Ah, okay. The Feast of the Immaculate Conception. [Sigh] Well, alright then… let’s get our piousness on. 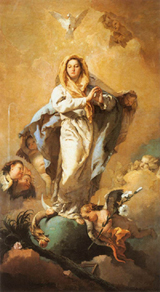 The Feast of the Immaculate Conception is actually a holiday brought over from the Eastern (Byzantine) church in the 7th Century, and is celebrated in most traditionally Catholic countries. For many Spaniards, it represents the true beginning of the Christmas season. I’m not able to find any news or information about how the holiday is being celebrated in Valencia. But, church bells have been ringing for the past hour and a half, which indicates that something is afoot. There’s a good chance that some sort of traditional dance or musical performance will be held in Plaza de la Virgen today … but this is just a total guess. If we find out more, we’ll update this post, but we’d love for any of our native Valencian readers to leave comments, and tell us how La Inmaculada is celebrated here!